This is an interview with Dylan James. Dylan completed ESLinsider's 20 hour online TEFL course. He is from London, England. He is currently teaching in Chengdu, China. He has also taught in France and Honduras. Chengdu is quite a special place. Before coming to Chengdu I'd never been to China, and never been to Asia. I think I made a great choice. I was tempted by Beijing and Shanghai. Although now after 6 months of being in Chengdu, and talking with people who have lived and worked in those other cities, I think Chengdu seems to have an edge. There are around 14 million people here, but it feels so calm, like a very laid back place. I never feel rushed here, which feels weird. I had a movie style image of China in my head before coming, people rushing around everywhere, too many people, people being jammed into the subway. Here in Chengdu this doesn't happen. In the past 10 years Chengdu has seen a big change as it is becoming the industrial capital of western China. We only have 2 metro lines here now, but in the next few years another 8 lines will be built. Even though there are these changes, I think the spirit of Sichuan and Chengdu will always be here. There is a Chinese joke that 'you know when you arrive in Chengdu because it sounds like the airplane engines are still running after you land'. In reality it's the sounds of mahjong and tea drinking. People here in Chengdu take mahjong very seriously, they take their food even more seriously. People take their enjoyment of life seriously. If we look for equivalent cities in Europe for example, then maybe Shanghai is Berlin, Beijing is London, and Chengdu is Madrid. It's more laid back, people take food and fun more seriously and it gets very hot! How does teaching in China compare to France or Honduras? Teaching here in China is very different from my experiences teaching in France and Honduras. In France I was doing mostly private tutoring and I can speak French, so that helped a lot. In Honduras I worked in a small private bilingual school, I can also speak fairly good Spanish and the classes were small, so that was a great help too. 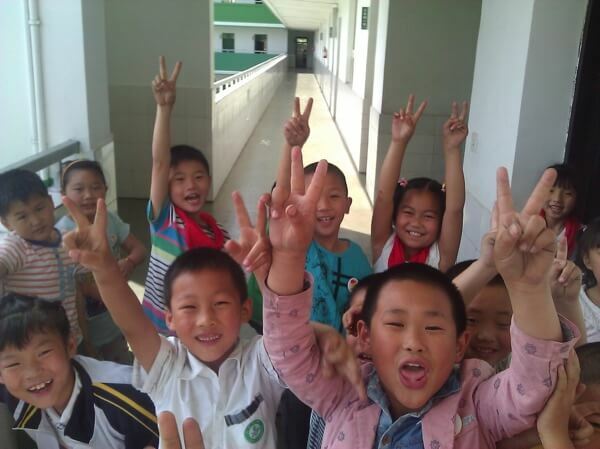 Here in China I'm working at a public primary school, I can only speak very basic Mandarin, no Sichuanese and my classes all have around 40 students. So with such big classes and my lack of Chinese it can be a little frustrating at times, but it's also very funny. I teach grades 1-5 so it's quite a contrast, the grade 1 kids are so tiny, and the grade 5 kids are almost ready for high school. Being a primary school teacher and not speaking Mandarin results in a lot of jumping around and singing and games. Usually I have a Chinese teacher in the classroom with me, so if I really get stuck then I have someone to help translate instructions or explanations. Although I think a lot of people believe that not speaking to the students in their native language can really help the acquisition of the new language. In Honduras my school told me they preferred teachers with no Spanish. Here in Chengdu we have text books for grades 3 upwards, so I have to stick to the material in the books, as it will be covered at the end of semester exams. Although for grades 1 and 2 we don't have a book, so I can just do my own thing, make some presentations, play some games, sing songs, etc. I can deviate a little from the books in my other classes as well, my school wants me to teach the students about cultural differences between the UK and China. It's good fun being able to make my own lesson plans based on my own topics or themes. I got my job thanks to an ad I found on Dave's ESL Cafe, I am working for an agency that places teachers in all kinds of schools in the Chengdu area. The agency happens to have an office in Manchester in the UK. As it's the first time I've come out here to China, knowing that there's an office and a fellow Brit contact back home was reassuring. There are some horror stories out there, people being scammed out of money, having their passports held, etc. Luckily everything has been very smooth for me. I think if you do your research and think things through, there's no need to get scammed! What kind of visa did you start with? I came here with a student visa, my agency also provides TESOL training, so I was happy to do that. I have since had my visa extended. I will have to do a visa run to Hong Kong soon, my new visa will be the expert working visa. Thankfully my agency pays for flights to Shenzhen and accommodation, I should also be going with another teacher from the agency, so that's all very helpful and convenient. How much money did you need to get started? To get started here I really didn't need too much money. One way flights from London can cost anything from 400 to 600 pounds. If you're willing to do some crazy lay overs it can be even cheaper, so I've been told anyway. I just flew from London to Abu Dhabi then on to Chengdu. So once I paid for my flight I just needed a little cash for the first month here, and Sichuan is a lot less expensive than other places in China, like Shanghai and Beijing. So my first month I only spent around 3000RMB ($480), which is around 300 pounds. My agency provide a free apartment, free transport, and I get a free lunch at school. So really I was just paying for some groceries, eating out, beers and other luxuries. Even though there are all of these positives, there is still the issue of pollution. In the six months I've been here, I've seen very smoggy days where the pollution index is dangerously high and it's probably not too good to be outside too long. Other days it's been great, clear, sunny and low levels. It's just something to get used to. We don't have anywhere near the problems of Beijing and other places, and if you want to be safe you can get good quality masks and air purifiers. All in all I feel very comfortable here, even on the smoggy days. Just pick the right day to go for a walk around the city. Are there a lot of foreigners in Chengdu? Chengdu is a very big city, but still not on the scale of Shanghai or Beijing. Although I've been told that, even in the past 2 years or so, there are noticeably more foreigners here. I myself still find it odd sometimes seeing other foreigners walking around town. However if you go to certain bars/restaurants/clubs you will see a lot of expats. Other than teachers, there are also a lot of students that come to Chengdu to study at the Sichuan University. So close to the campus there a quite a few expat style bars, you can watch soccer or American football, eat a burger or pizza, and always find some new foreign friends. I think we have a big advantage here, people have told me that, in other cities where there are more expats, locals just don't care that you're a foreigner or may even slightly resent your presence. Whereas here in Chengdu we are still an oddity, people are curious and happy to try out their English, make friends, even invite you out to dinner when you only just met. Also many bars and restaurants will have a special foreigner discount card, or a expat special price or promotion. So where the locals might be buying their beer for 10rmb you're getting beers for only 5! Another thing to mention is that Chengdu is still a huge city, so whatever you want to do you can find it here. All kinds of groups and clubs have been set up by expats and locals. You can play amateur soccer, join a badminton club, learn how to play weiqi, practice your Spanish skills, go on trips with language schools for free, learn mandarin for free at the University. It would be hard to get bored here. How did you hook up with a Chinese punk band? I myself have been playing bass guitar in a punk band here in Chengdu. I was introduced to a friend of a friend, we talked about our love of live music and so we went to see the Chinese punk band SMZB. I found out these guys were basically the first Chinese punk band ever! They were awesome, and after I mentioned that I play the bass, I was introduced to some guys at the show who were looking for a bass player. Apparently finding a bass player for a punk band in Chengdu isn't so easy. So when I agreed to join the guys were really pleased. We just messed around every week, playing for friends, we go to a small practice room, but it's a very relaxed place, so people can come watch and have a drink and a good time. I have to admit I was a little cautious at first, I arrived in China not so long after the demonstrations in Hong Kong, and the band I play in is called 'The Protesters' needless to say I was a bit nervous. I've been assured though that the only issue we'll face is never getting a record deal, no one would dare let us record anything. That suits me fine! What's been the biggest challenge about living there? The only thing I don't like about living here is my lack of Mandarin or Sichuanese, it's no problem really, I can get by, but having some conversational Chinese would be great, I feel bad always going to the same convenience store and not being able to have a chat with the guys working there. I hope with time though it'll get easier and easier. The other problem is organisation, Chinese organisation isn't the best, but if you go with the flow and take it easy, stuff gets done, even if it's the last minute. Overall I have enjoyed every minute here, there's so much to see, to much to learn, and in Sichuan there's so much to eat! It's the 'land of abundance'. There is definitely an abundance of everything here, good food, good people, opportunities, jobs, sights, culture, history, the list just goes on. If you like you can contact Dylan at: dylanjameschengdu@hotmail.com. You can also watch more interviews here of teachers in China.